This post is part of the 31 days of STEM activities for kids series. One of my favorite things to do when I was young was make play stores for my siblings. However, our stores were never quite as math-intensive as this particular store that Monkey and I set up together. Scroll to the end of the post to get your copy of our play store printable! 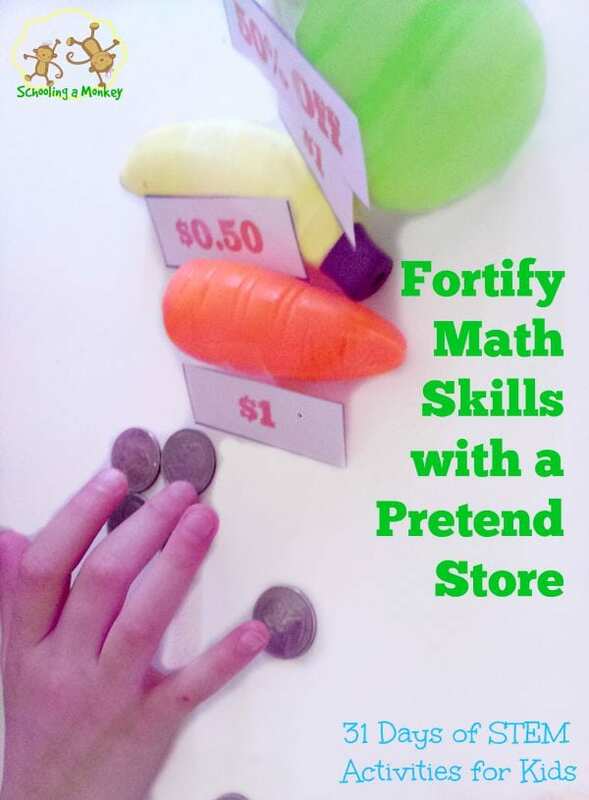 One of the things that I love about play store math STEM activities is that not only does it seem more fun than regular math, but play store math can be scaled to fit the math level of any elementary-aged child and is one of our favorite living math ideas! 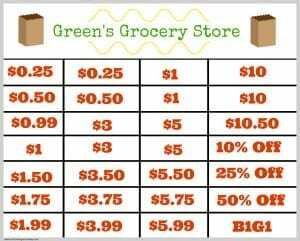 Monkey just finished third grade, so we didn’t go into percents much, but older children can definitely use their new percent skills to operate a finely-tuned grocery store! This is one proud shop owner. Attach your prices to your items however you like. You can stay realistic, or you can create imaginary prices. I think we had a banana at one point that was $10. Take turns as the customer and the shop owner. Both take a separate set of math skills. Discuss the importance of double-checking math on both sides. Monkey preferred being the customer to the shop owner. At our store, we had a few sale items and a B1G1 sale, which made things a little trickier. Play until you get bored. 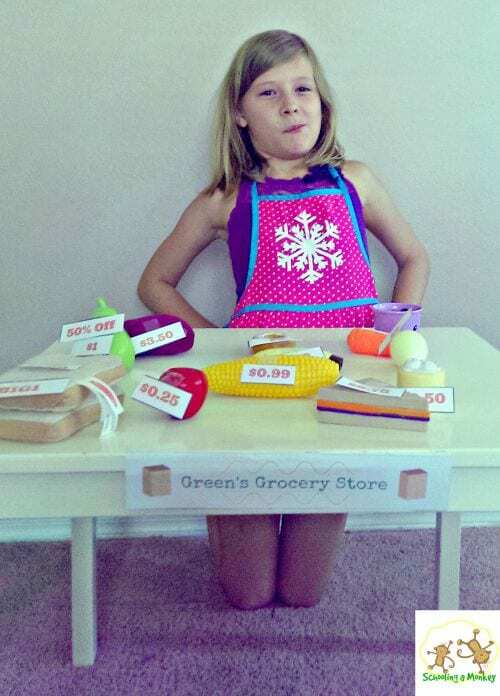 Play store math is a fun and easy way to build up quick math skills and also builds the life skill of learning how to exchange money at a real store without the disapproving line stacking up behind you giving you dirty looks for allowing your child to make her own purchase (true story). Need more fun math activities? We’ve got you covered in the whole 31 days of STEM series! Find out more about homeschooling in the 31 days of homeschooling tips for moms series.